Toronto has lots of Christian churches, many of which are from other parts of the world. You might want to celebrate Christmas in a slightly different way than usual by going to an event of one of these neighbours. If you don’t understand their language, you can always meditate, absorb the worshipful atmosphere, and think about how global the Christian community is. 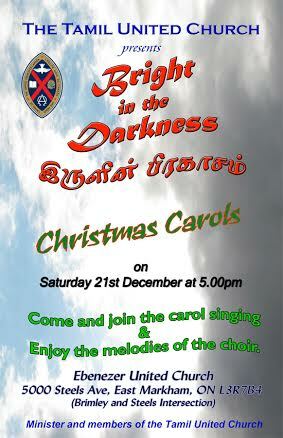 The Tamil United Church is having a Carol Sing on December 21 at 5pm. They will probably include some carols you know and some you don’t know. It’s an opportunity to broaden your horizons. It’s at the Ebenezer United Church, 5000 Steeles Avenue in Markham at Brimley. We will be adding other Christmas events as you tell us about them on www.torontomulticulturalcalendar.com . Drop us a line at: ruthlormalloy@gmail.com .